I know. Wins are hard to get in the NFL. Especially a win on the road in Kansas City, one of the hardest places to play in the NFL. Yes, I know the Bills were reeling after three straight bad losses, and were desperate for a victory. All of this is true. So why do I feel “unsatisfied” about Sunday’s win over the Chiefs? 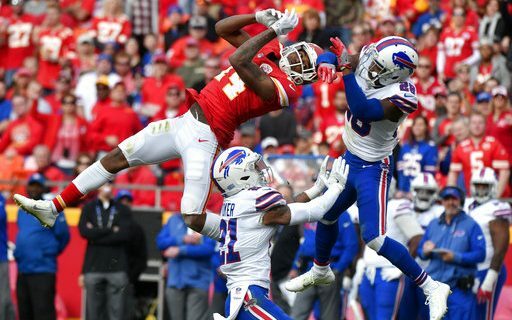 While the Bills did a lot of good things to make it a win, especially on defense, why do I feel like they only won because the Chiefs are a current disaster? I really hate feeling like this. I hate being the guy who points out that when a team wins, it only happened because the other team handed it to them. No one wins in the NFL without making plays, and forcing an opponent into mistakes. The offense struggled to move the ball and score points. 16 points rarely gets you a win in the NFL. The Bills were the only team on Sunday to score that few and win. Lesean McCoy and the running game struggled again, generating only 2.8 yards per rush. I did like what the defense did in shutting down high-powered weapons Travis Kelce and Tyreek Hill. The tackling was especially good, limiting the Chiefs to short gains and holding them to one first down in the second half. Taylor did the best thing he always does: He didn’t make mistakes and didn’t turn the ball over. But I’m still left wanting more from this team. This kind of performance gets you a win against a KC team that’s a mess. It doesn’t get you win against any of the better AFC teams, of which the Bills will face this Sunday (Patriots). Maybe my standards are too high. The AFC is a muddled mess, and the Bills may be less-muddled enough to grab a playoff spot if they can beat the equally mediocre teams. There are still three of those games left (Miami twice, Indy). I am desperate for Bills fans to feel good about their team, and see a playoff game for the first time since 1999. But I want this team to strive for more. I don’t want a playoff trip and ensuing wild card loss just to keep people happy that the drought was over. I want to see a team that will contend for division titles and Super Bowls. I don’t see anything close to that yet. Maybe that’s why even good road wins have me longing for something more, longing to fee “satisifed” after every victory.